Marshall infielder Blakely Burch (55) flips the ball to Aly Harrell (43) following an out during Marshall's game at Dot Hicks Field against Morehead State on April 11, 2018. 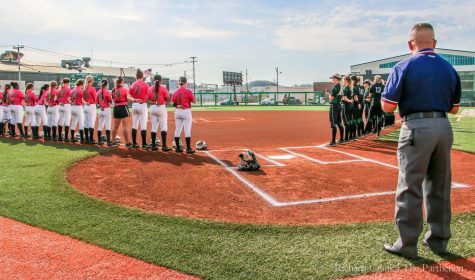 Marshall softball welcomes the Kentucky Wildcats to Huntington Wednesday after coming off a series win against Charlotte. The game will be on the Dot Hicks Field at Marshall University at 3 p.m. 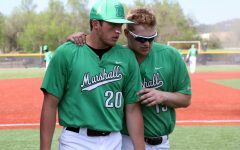 So far this season the Herd sits at 19-7, overall and 2-1 in Conference with two wins against Charlotte last weekend. 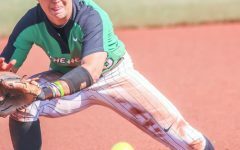 In the 2-1 series against Charlotte, Marshall won 7-5 in game one, 13-0 in game two but lost in the third game 11-6. In game one, freshman outfielder Mya Stevenson had a career day where she recorded her first cycle and drove in seven runs between the two games. She combined for seven hits and nine RBIs. Although the game went back and forth with Marshall taking the lead and Charlotte retaliating, Stevenson led in the seventh with a double, advanced to third on a junior infielder, Sierra Huerta, sacrifice bunt and scored on a senior catcher, Hayden Ellis, single to center. 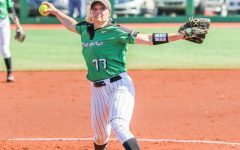 The Herd held the 49ers from scoring in the bottom of the inning giving the Herd the win. 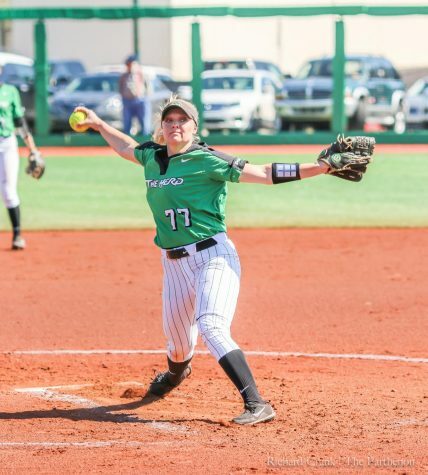 Senior pitcher Abigail Tolbert earned her 12th win, which matched her career-high. 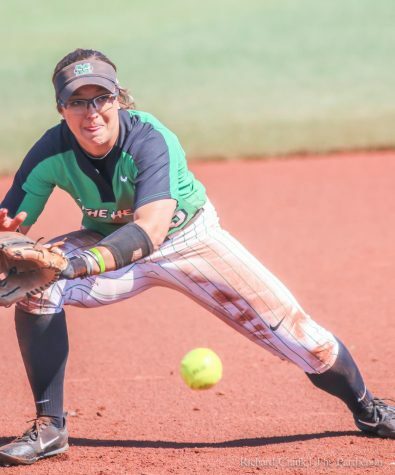 In game two, the Herd scored 13 runs on 13 hits. Stevenson went three-for-three at the plate including a homerun and two doubles. She was walked her last at-bat. Senior outfielder Hannah Giammarino started the game with a solo homer. Sophomore infielder Armani Brown singled and advanced on an Aly Harrell walk. Both scored on a Stevenson homer over left to start Marshall with a 4-0 lead. 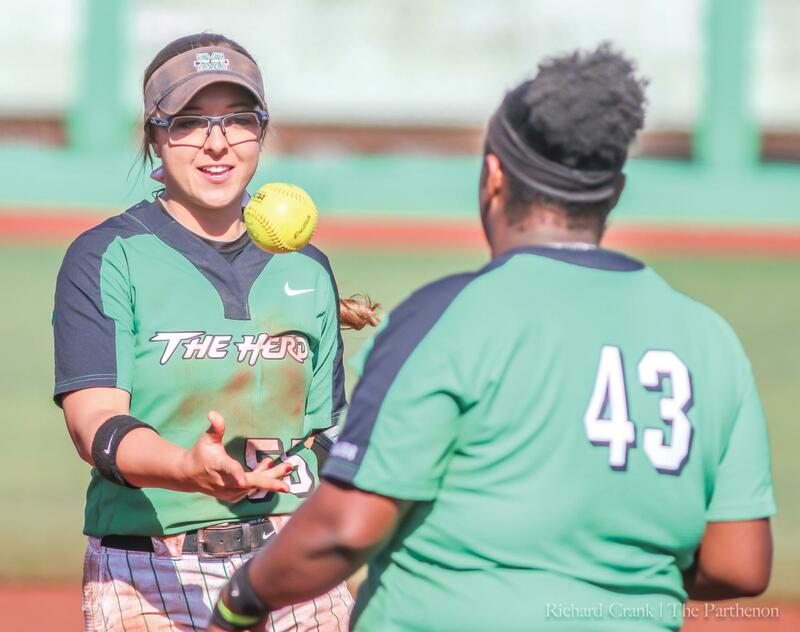 Senior outfielder Abigail Estrada started the Herd off in the second with a single, advanced when Giammarino singled. 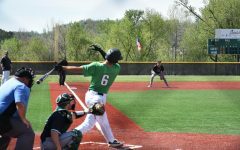 Sophomore infielder Harrell was intentionally walked, loading the bases for the Herd. Stevenson doubled scoring two. 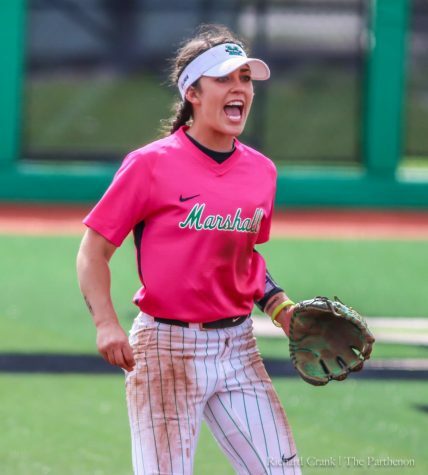 Junior infielder Blakely Burch drove in Harrell, giving the Herd a 7-0 lead. The third inning was also a big inning for the Herd, scoring three more runs. Ellis was walked, Estrada singled and Giammarino collected a hit to load the bases. Harrell grounded out to short, but Ellis was able to score. Stevenson doubled to right-center, scoring both Estrada and Giammarino. Charlotte walked both Harrell and Stevenson. Freshman outfielders Rachel Pennington and Chloe Lee both entered to pinch run for the duo. Huerta singled and scored Pennington. Burch and senior infielder Briana Daiss were safe due to Charlotte’s errors, which brought Lee and Huerta home. Marshall wins 13-0 and junior pitcher Kailee Williamson collected the win. 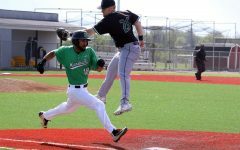 In Sunday’s game, the Herd fell 11-6. Huerta led with a double, Brown followed with a single. Huerta scored on a Harrell hit, and Brown scored on a Stevenson double. Charlotte quickly responded with three runs, taking the lead. Marshall took the lead back on an Ellis three-run homer to left. Charlotte regained the lead 6-5 on two walks and four hits in the fourth. Charlotte scored five more runs between the fifth and sixth inning. The Herd scored again in the top of the seventh. Burch doubled and advanced on a hit to center by junior infielder Brooke Burns. Burch scored on a Huerta sacrifice fly to deep center. The Herd is set to face the 20-7 Kentucky Wildcats on Wednesday. The Herd is currently 2-12 against the Wildcats, with its most recent win coming in 2001. Marshall has never beaten Kentucky at home. Currently the Wildcats are ranked 13th in the country and are on an 11-game win streak and are 6-0 in the SEC with three-game sweeps of South Carolina and Mississippi State. First pitch from Dot Hicks Field is set for 3 p.m. Wednesday.